The Process-Focused Case Formulation encourages clinicians to make hypotheses regarding mechanisms or processes which they believe may be maintaining the client’s presenting difficulties. Some clients present with clearly identifiable symptoms of a specific disorder, in which case it is often appropriate to use evidence-based manualized treatments. However, many clients present with comorbid difficulties, or problems where no clear evidence-based treatment exists. In these circumstances it is essential that clinicians be able to formulate client difficulties using a theory-driven approach. 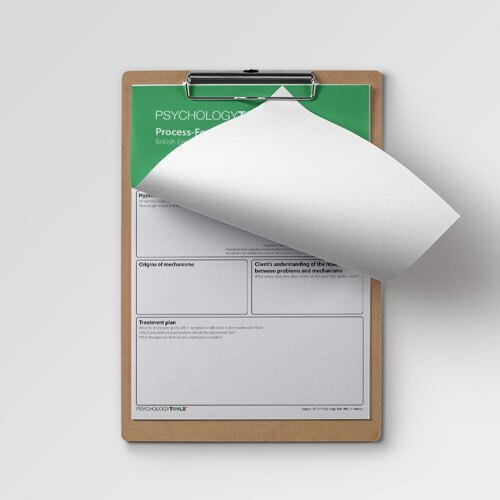 The Process-Focused Case Formulation encourages clinicians to make hypotheses regarding mechanisms or processes which they believe may be maintaining the client’s presenting difficulties. These mechanisms can be informed by multiple treatment approaches. For example, a behavioral approach to a problem would focus on antecedents and consequences, a cognitive approach might focus beliefs / assumptions / thoughts associated which contribute to the difficulty, and a systemic approach might focus on factors external to the individual. 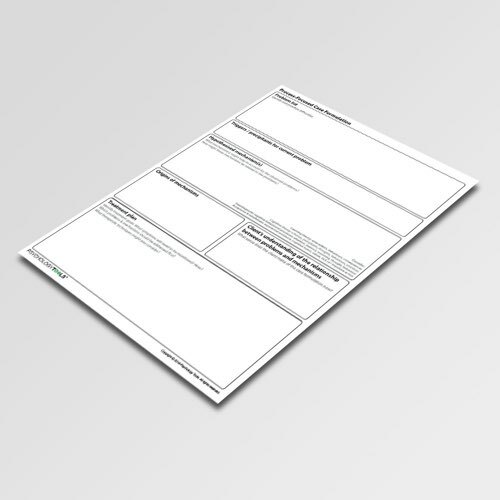 This worksheet guides the clinician’s thinking through a number of the most important steps of an individualised case formulation. The goal is not to develop a ‘perfect’ model but instead to generate hypotheses which can be tested, the result of which can inform further iterations of the formulation. 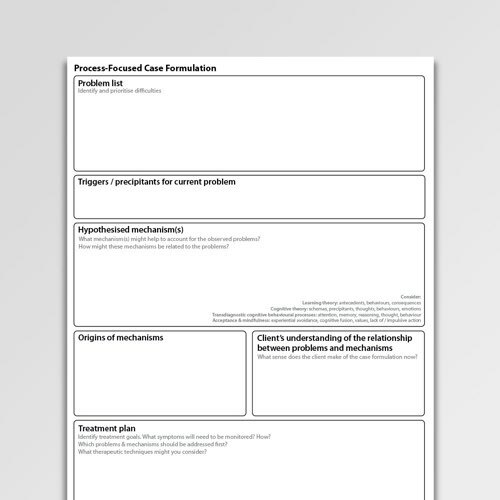 This case formulation worksheet has sections to guide the therapist in developing an individualised case formulation. Hypothesised mechanism(s) – Brainstorm potential mechanisms by which the problems may be being maintained. This section is theory-agnostic and can include behavioral, cognitive, psychodynamic, or acceptance/mindfulness mechanisms. As examples, a behavioural approach might focus on the antecedents and consequences of a problem to look for possible maintaining factors. An ACT approach might focus on client behaviors which indicate cognitive inflexibility. Client’s understanding of the relationship between problems and mechanisms – Once a shared formulation has been developed, do the hypothesised mechanisms have ‘face validity’ for the client? 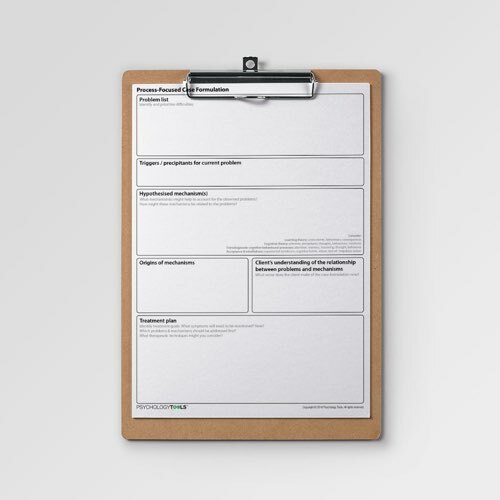 Treatment plan – Consider treatment goals, symptoms which need to be monitored, which problems or mechanisms need to be prioritised (or could lead to ‘quick wins’), and which therapeutic techniques could be helpful. If multiple hypotheses have been generated it is helpful to consider in advance what further information is needed to help disambiguate between potential options. It is also helpful to consider potential obstacles to treatment. Frank, R, I., Davidson, J. (2014). The transdiagnostic road map to case formulation and treatment planning. Oakland: New Harbinger. Persons, J. B. (2008). The case formulation approach to cognitive behaviour therapy. New York: The Guilford Press. Watkins, E., Mansell, W., & Harvey, R. S. A. (2004). Cognitive Behavioural Processes Across Psychological Disorders: A Transdiagnostic Approach to Research and Treatment. Oxford: Oxford University Press.